Highmark Blue Cross and Blue Shield has selected Indiana Regional Medical Center as a Blue Distinction Center+ for Knee and Hip Replacement, part of the Blue Distinction Specialty Care program. Blue Distinction Centers are nationally designated health care facilities shown to deliver improved patient safety and better health outcomes, based on objective measures that were developed by Blue Cross and Blue Shield companies with input from the medical community. Knee and hip replacement procedures are among the fastest-growing medical treatments in the U.S., according to studies published in the June 2014 Journal of Bone and Joint Surgery and the American Academy of Orthopaedic Surgeons. In 2010, the estimated cost of hip replacements averaged $17,500 and the estimated cost of knee replacements averaged $16,000, according to the Agency for Healthcare Research and Quality. Designated hospitals must also maintain national accreditation. In addition to meeting these quality thresholds, hospitals designated as Blue Distinction Centers+ are on average 20 percent more cost-efficient in an episode of care compared to other hospitals. Only those facilities that first meet nationally established, objective quality measures will be considered for designation as a Blue Distinction Center+. To earn this designation, IRMC was evaluated based on objective, evidence-based selection criteria established with input from expert physicians and medical organization. The goal of Blue Distinction+ is to identify medical facilities that deliver better overall quality and medical outcomes, and demonstrate cost efficiency for a specific area of specialty care, helping patients and doctors to make more informed hospital choices. Indiana Regional conducts more than 200 joint replacement surgeries each year. IRMC is proud to be recognized by Highmark BCBS for meeting the robust selection criteria for knee and hip replacements set by the Blue Distinction Specialty Care program. “This designation is a tribute to the dedicated team of physicians, nurses, technicians and therapists who helped develop Indiana Regional Medical Center’s comprehensive program in hip and knee replacement surgery,” said Stephen Wolfe, CEO of IRMC. Since 2006, the Blue Distinction Specialty Care program has helped patients find quality providers for their specialty care needs in the areas of bariatric surgery, cardiac care, complex and rare cancers, knee and hip replacements, maternity care, spine surgery and transplants, while encouraging health care professionals to improve the care they deliver. “Highmark Blue Cross Blue Shield extends its sincere congratulations to Indiana Regional Medical Center for their dedication to quality, patient safety, and transparency that is required to achieve this great distinction. “With consumer-driven health care programs like Blue Distinction, and the significant effort of our partner practitioners and facilities, Highmark can now enable our members the opportunity to make wise, value-driven health care decisions,” said Dr. Mark Piasio, medical director, Clinical Services, Highmark Inc.
For more information about the program and for a complete listing of the designated facilities, visit www. bcbs.com/bluedistinction. Terry Anderson first noticed his concussion symptoms during conversations. He said it felt like they were moving faster than he could understand. The symptoms evolved to include double vision and falling down, where he would basically fall over backwards, he said. He began slurring his speech and was unable to drive. He could sometimes only get out a few words on paper before he began to struggle and eventually his left hand would cease to move. His leg began to drag. “Doctors would ask me about my symptoms and they sounded so crazy because they were all looking for the normal situations,” Anderson said. He figures it was probably seven years from the first time he started noticing symptoms to the time he was diagnosed and concussions were found to be the culprit for his problems. For three of those years he kept teaching at Young Brothers Tae Kwon-Do. He credits his assistant instructors for allowing him to continue teaching as long as he did. The weather has an effect on his symptoms. On high-pressure days, they weren’t as bad. But on low-pressure days he could sometimes barely get out of bed. Anderson said he spent years confused and frustrated about his symptoms. It wasn’t until a physical therapist that was treating his vertigo recommended a doctor at the Center for Orthopaedic and Sports Medicine at Indiana Regional Medical Center to look at his symptoms through the lens of concussions. He will never get back the full health he had before the years of concussions eroded away his “processor,” as he calls it. He is one of many who are learning to cope with post-concussion syndrome. 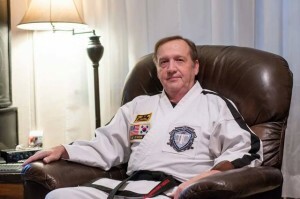 Anderson was forced to sell Young Brothers and quit teaching tae kwon do, his decades-long passion, his identity and his place in the world. He was able to ride due to the high pressure that would build when he was moving. Just like he experiences reduced symptoms on high-pressure days, the pressure of the wind would allow him to ride his Harley-Davidson. This was how he spent some of his four years between Young Brothers and the true diagnosis of his symptoms. Anderson said he never knew when his symptoms would strike. This made diagnosis of the root of his problem even more difficult for the doctors. Eventually a friend gave him a brochure about balance work at COSM. But this required him to be rediagnosed before he could seek treatment. He returned to UPMC for vertigo tests. It did not go well. “I think it was a worse failure than the first time,” he said after a laugh. He sat in a round room with a swiveling chair at the center. They gave him goggles that allowed them to see his eyes, but he couldn’t see anything. The chair would then turn slowly to the right or the left and they would watch what his eyes do. “The chair moved about three inches and I fell forward and started throwing up,” he said. He was then recommended to Dr. Eric Bohn, who specializes in concussions, and physical therapist Jamie Chichy. “I went there very skeptical because of the length of time I suffered with it,” Anderson said of his first visit to Bohn. Bohn is from the Reading area and played high school football. At a mere 165 pounds, he was playing on the line and taking frequent hits. He figures he had about five or six concussions of his own from football. “The mantra of those days was ‘Shake it off, get back in there,’” he said. He finished his residency at St. Joseph’s in the Reading area and was six years into his family practice before he decided to focus again on sports and concussions. During his exposure to concussion patients, he realized there was much more to diagnosing than having a patient simply wiggle their fingers back and forth and asking them if they feel OK. He said he realized there was a psychiatric component. Bohn checked Anderson’s symptoms off a list for concussions at one of their first meetings. Bohn said concussions play dirty, in that they exacerbate any prior emotional or cognitive problems a person had before. If you have a short fuse, it becomes even shorter when the brain is trying to recover from concussion damage. The same goes for anxiety, depression and other mood disorders. “To use a Spinal Tap reference, it goes to 11,” Bohn said. He said he sees this especially through his younger athletes since their bodies are developing and there is often drama going on with a team or in their home lives. The amplification of mood disorders comes from an overload of stimuli on the brain. Anderson referred to it as processor overload, an analogy Bohn likes. He said it’s like when too many programs are running on a computer and things get slow and choppy. Simple things like too many conversations happening in a room at the same time or cars going by can cause problems for an injured brain. “Simple stimuli to acclimate yourself becomes almost overwhelming,” Bohn said. Anderson said he would sit in his chair in his apartment with the lights out and ear plugs on just to cut off the stimuli. High school football was where, like for many athletes and Bohn, Anderson experienced some of his first concussions. But also years of tae kwon do training contributed to his brain damage. It was difficult for him to put a number on his concussions, but he figured there were about five serious ones. Two knocked him unconscious and put him in the hospital. There were several smaller, less noticeable concussions, perhaps even some that he didn’t realize at the time. Headgear came into the scene for Anderson in about 1990. Tae kwon do safety had been building to that point with other safety gear, starting with footgear and gloves. The uniform also now includes chest protectors. This is not all necessarily a good thing, Anderson said, though he said he believes headgear should have been instituted from the very beginning. He himself buys the double-layered headgear for obvious reasons. Think smoking, he said. It’s not the one or two packs that get you, it’s the 40 years of damage. Bohn said it takes time with patients to find out the extent of the damage. “You have to pick a little bit,” he said. He asks patients about their sleep and relationships and about simple tasks like reading or balancing their checkbook. He said he’s trying to treat the whole of the patient and not just look at it like chemical interactions and numbers. But there is no definitive set of questions and Bohn will pursue different avenues for different patients. He said he doesn’t always get the time he needs. He said he’ll wait about a minimum of two weeks before considering medications like SSRIs (selective serotonin re-uptake inhibitors) to regulate mood. When mood is regulated, usually the headaches get better because the brain can heal itself without added stresses. Bohn believes counseling of some kind is very important to help “cut through the muck.” It could be with a psychiatrist, or faith-based counseling or just having a friend or family member to regularly talk to. For Anderson, Bohn soon realized they would need to tackle a brain chemistry problem along with the physical problems. Part of Anderson’s physical therapy involved a large light board where he would touch the bulbs and they would go off. It started simply enough, just touching lights with one hand or the other. Then it evolved to touching only certain colored bulbs, then bulbs in certain circles. Eventually, they incorporated multitasking where he would touch bulbs and do math problems. He said they would usually go for as long they could until he couldn’t take any more. He’s learned when to pull back in everyday life and take it easy when he’s reached his physical limit for the day. He figures on a good day he’s at about 90 percent of what he used to be able to do. On a bad day, it can be 60 percent or lower. He likely won’t find him now at his usual stool putting back drinks, and though you might see him on the back of his Harley, he has since left the motorcycle club. “I have been given back my life. A second chance at life,” Anderson said. Anderson’s new tae kwon do studio in the 200 block of Philadelphia Street has enough space for the mat floor gym, a small office and two changing rooms. He handles many fewer students than he did at his old school. He opened the new studio in 2014. He still takes the ones with the “situations,” as one of his former students and now an instructor in Pittsburgh put it to him recently. Anderson is known locally for teaching students with special needs, many of whom are on the autism spectrum. He said he also has students with life-threatening or terminal illnesses. Anderson prides himself in being strict with his students, but when he talks about them he refers to them as his children. “If I was here for money, over half the people in that picture wouldn’t be here,” he said, pointing to a recent photograph of his students. He said he believes he is helping the students cope with the problems in their life by giving them confidence and control. He sees the psychological scars of bullying all the time through the resulting emotional pain. 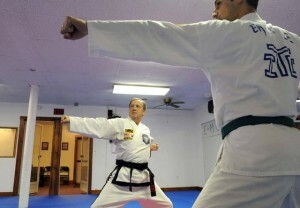 From his point of view, tae kwon do can mitigate that pain. Though he’ll probably never be back to where he was before his symptoms pulled him down, he said the struggle has reinforced his beliefs on helping others and injecting discipline and confidence into others. “It changed how I see the value of people in trouble,” he said. Doctors may soon be able to learn about concussions through a patient’s blood, Bohn said. He said it’s not ready for primetime, but blood serum markers may show if the brain is inflamed or damaged, similar to when doctors draw for cardiac enzymes when someone has suffered a heart attack. Bohn said doctors are also learning about gene sequences related to concussions, and testing may determine if a person is especially susceptible to the damage of a concussion and could take longer to heal. He also referenced diffused tensor imaging that allows doctors to visualize intricate parts of the brain. All of these things may help keep athletes safe, but it may also feel unfair and the subject is worth some ethical considerations. Football, ice hockey and wrestling are the most high-risk sports, he said, but other sports like cheerleading are sending more his way. He said he would like a way to screen people to let them know if they are susceptible to brain damage. For more information about our hip and knee replacement program, contact the Center for Orthopaedics and Sports Medicine (COSM) at (724) 465-2676. Dr. Craig McKirgan played football and basketball in high school, but he didn’t try skiing until he was an undergrad student at Iowa State University in the late 1970s. some of the planet’s best athletes. McKirgan has been getting away from his day job at COSM occasionally to serve as a team physician for the U.S. men’s Alpine ski team. 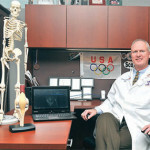 It’s a blending of two of his interests — sports and medicine. And it’s volunteer service. “It’s something I really enjoy,” he said. “It’s a great experience to work with that level of athletes. Just the organization is very, very impressive. McKirgan was a member of the medical team for the 1996 Summer Olympic Games in Atlanta and the 2003 Pan American Games in the Dominican Republic. Since 2007, his assignments as the physician for the men’s Alpine ski team have taken him to World Cup competitions — which help decide who will represent countries in the Olympics — in Italy three times, and in Austria, Switzerland and France. The assignments typically involve a week or two each winter. “These guys don’t ski every four years. They’re skiing 12 months a year” in World Cup competitions, McKirgan said. “Pretty much every weekend or every other week they’re skiing in some international competition” in the U.S. Canada or Europe. “There is not one team physician that stays with these guys through the calendar year. So there’s a group of us” sharing duties as the team doctor. An athletic trainer stays with the team year-round. “We’re there to assist him,” McKirgan said. “Usually when I’m at an event it’s usually the ‘A Team’ — that’s Bode Miller, Ted Ligety and those guys,” with about a dozen athletes on the team. Being selected as a team doctor for the U.S. Olympic Committee is a long process that involves submitting an application and going through security and background checks and credentialing. It’s also imperative to have experience working with athletic teams. McKirgan has been involved with athletic training and sports medicine at Indiana University of Pennsylvania since 1994. His preparation for a World Cup competition starts in the spring when he gets his assignment. One of the first things he does is review the World Anti-Doping Agency rules so he knows which medicines are banned. “Some drugs we may have used in ’96 we can’t use now,” he said. “Once I get my assignment I start researching where the medical facilities are in that area,” he said. “In the United States we take it for granted that wherever you are and get hurt, you call 911. … In some of these other countries it may not be that wellorganized. “I get there before the team gets there and I’ll go to the venue, which is usually a small community, smaller than Indiana. It’s a village at the base of a ski resort, not a great big metropolitan area,” and may have a clinic rather than a hospital, he said. McKirgan said he also goes to trauma centers to meet local surgeons. “The time to introduce myself is not during an emergency when I’m bringing an athlete in,” he said. Olympic-level sports on the side of an icy mountain can easily result in serious injuries. The team doctors also deal with concussions, abdominal injuries and chest trauma. The team physician may also treat an athlete for something as common as a cold. “We’re with them 24/7 pretty much,” McKirgan said. Injured Olympic athletes can also be a special breed of patient. “They’re extremely motivated to do whatever you ask them to do to get better to compete,” he said. “Their level of health is top-notch” and they pay close attention to their nutrition and do everything to stay healthy. “If you look at the downhill (athletes), the top 20 skiers are within two seconds of each other and they’re going two miles. … They’re willing to do whatever it takes to get back to competition” and they’ll work through some discomfort. Another qualification for the ski team physicians is that they are skiers, too. McKirgan is usually positioned a short distance down the hill below the starting gate. Coaches and staff members located along the race course are in contact with each other by radios. It might seem that a little recreational skiing would be a perk of being a ski team physician. But there’s not much free time for the doctors. said. But in reality the athletes are training all the days leading up to the competition. In March, McKirgan will be off to Lenzerheide, Switzerland, as the team physician during the World Cup Finals. “I am very appreciative that I have partners and staff here at COSM who help support me,” he said.